As this proverb is very common that “An apple a day, keeps the doctor away”. In the same manner, “A single bulb of garlic a day, keep diseases away”. Garlic is rich in compounds like Allicin, Sulphur, Zinc and Calcium that have health benefits, beauty benefits as well as antibiotic and antifungal properties. It is also a rich source of a mineral known as selenium. Selenium is known to fight cancer and it works with vitamin E in the body to boost antioxidant power. Garlic also acts as a blood thinner due to its salicylate content. This enables proper blood flow and enhances circulatory health. Stops Hair loss — Garlic could end your hair loss problems because of its high levels of allicin, a sulfur compound similar to that found in onions, which were found to effectively treat hair loss. Rub sliced cloves of garlic on your scalp, squeezing as you go for the most benefit. You can also infuse oil with garlic and massage it into your scalp. Clears Acne — It might not be a main ingredient in your drugstore acne medication, but garlic makes a great natural remedy to banish unsightly blemishes. 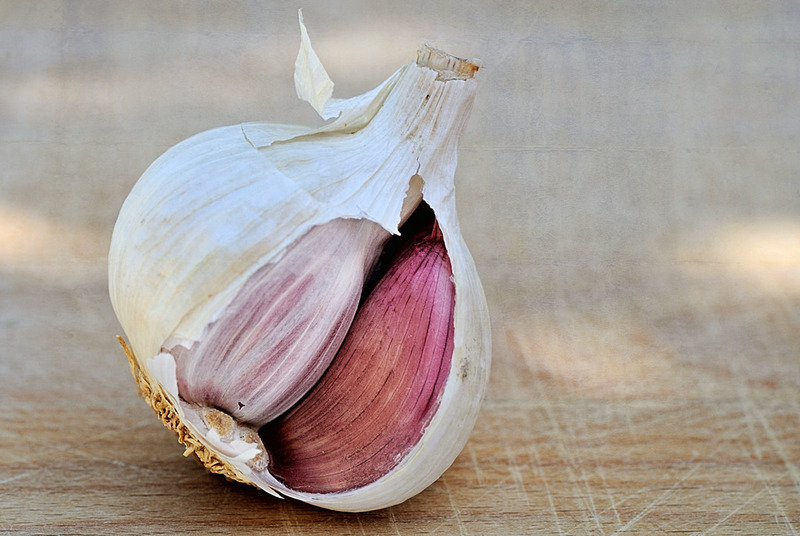 Its antioxidants kill bacteria, so rub a sliced clove of garlic on the pimple for an effective topical treatment. Prevents and treats Cold — Packed with antioxidants, a daily dose of garlic in your recipes could benefit your immune system. If a cold does sneak by, try sipping garlic tea: steep chopped or minced garlic in hot water for several minutes, then strain and drink. You can add a bit of honey or ginger to improve the taste. Soothes Psoriasis — Since garlic has proven anti inflammatory properties, it could be useful in relieving uncomfortable psoriasis outbreaks. Try rubbing a little garlic oil on the affected area for smooth, rash-free skin. Controls weight — Garlic could help you control your weight. To take advantage of this benefit, try to cook with garlic daily. Treats Athlete’s foot — With its anti fungal properties, some people swear that a benefit of garlic is its ability to relieve itchy athlete’s foot. Soak your feet in a bath of warm water and crushed garlic. Blackhead Removal — Take 2-3 cloves garlic and crush them. Add 1 tbsp. of oatmeal, 1-2 drops of tea tree oil and half tsp. lemon juice. Mix these ingredients with honey to form a thick paste. Spread a thin layer of this paste onto clean skin. After letting it sit for 2-3 minutes, gently exfoliate your face followed by a rinse with warm water. Use this mask thrice in a week to see a visible reduction in blackheads. Anti aging and Pore minimization — Garlic beauty benefits also include the aid for anti aging. The strong anti-oxidants present in garlic help in reducing the free radical build up in the skin thus keeping it firm and youthful. It also contains sulphur, which helps the body to produce collagen which inturn helps in fighting wrinkles. Garlic also contains a large number of skin-protective polyphenols. Just crush some garlic pods and add the juice into your regular face masks for added goodness and preventing premature aging. Enlarged pores are a common problem in ageing skin. To minimize pores make a paste by mashing together half a tomato and 3-4 pods of garlic. Spread a thin layer of the paste onto your face. After 20 minutes, wash your face with lukewarm water and seal your pores with a final splash of cold water. Tomato and garlic both have antiseptic qualities that help in unclogging the skin, minimizes pores and tightens the skin. Consuming pill-size pieces of garlic every day also works great to protect the skin from damages caused by free radicals, oxidation, and environmental stressors that eventually results in wrinkles. Removes Stretch Mark — There are not many things that you can do to prevent stretch marks from appearing but garlic can definitely help you in getting rid of them. Stretch marks are known to reduce and vanish if you use garlic. Hot oil massage is one of the most commonly suggested home remedy for this problem. To make more effective, add juice from crushed garlic pods in the hot oil that you use. Use this oil regularly on your stretch marks and you will notice the difference in a few weeks. Instead of using garlic juice, you can also use garlic oil. Do take care not to add more than half tsp. of garlic oil. Bad Breath and body odor — Everyone is familiar with the term garlic breath which is used to describe bad breath caused by eating raw or too much garlic however along with the menace of bad breath; garlic often causes a pungent body odor. This pungent odor is caused by allyl methyl sulfide or AMS. AMS is a chemical composition absorbed into the blood during the metabolism of sulfur compounds that find its way into the human body through garlic. AMS once absorbed into the blood travels to the lungs and then out of the mouth causing what is popularly known as garlic breath. Garlic Supplements Unsafe For Pregnant Women — Garlic supplements sell well because of their healing properties however garlic reduces platelet aggregation just like aspirin which is why very high quantities of garlic or garlic supplements are considered detrimental to pregnant women and may cause risk of bleeding during pregnancy and after childbirth. Garlic Interacts With Antibiotics and Other Drugs — Garlic may interact with warfarin, antiplatelets, saquinavir, antihypertensive, calcium channel blockers and quinolone family of antibiotics so it’s best to consult a doctor about your garlic intake.